Cartier watch is the perfect gift for the gentleman in your life. Known for its classic, elegant look, Cartier watches for men are more than just a time piece. It’s jewelry for the gentleman with discriminating taste. The first Tank collection of Cartier watches for men were introduced in 1917 by Louis Cartier. There are 5 collections in the set. Tank Anglaise, Tank Louis Cartier, Tank Americaine, Tank Francaise and Tank Solo. This line of fine watches was inspired by the Renault Tanks during WWI. There are over 30 different types of Tank watches in the line. Each watch is a distinctive time piece sure to please any man. It’s hard to choose when it comes to Cartier watches, but depending on what you’re looking for, there’s a watch to cover your needs. The Tank Americaine is a great item produced only in precious metal, making these exclusive watches the perfect gift. 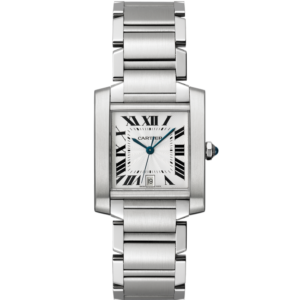 If you’re looking for a classic, stylish watch, check out the Tank Louis Cartier. This watch is always in style and sure to please. If there’s a particular face shape your man likes, the Tank Solo is available in both rectangular and oval making it a great watch for any occasion. Tank Francaise offers your choice of quartz or automatic, making it one of the most popular in the line. There are a host of other collections available in the Cartier men’s line as well.